Statistics current as of March 1, 2019. 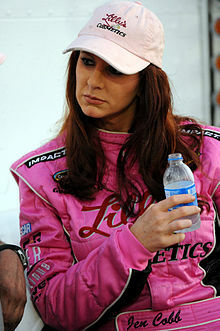 Jennifer Jo Cobb (born June 12, 1973) is an American professional stock car racing driver and team owner. She currently competes full-time in the NASCAR Gander Outdoors Truck Series, driving the No. 10 Chevrolet Silverado for JJC Racing, and part-time in the NASCAR Xfinity Series, driving the No. 55 Toyota Camry for JP Motorsports. She started racing in 1991 at Lakeside Speedway. Her father, Joe Cobb, races at Lakeside Speedway in the modified division. Since 2002, she has made 9 starts in the ARCA Racing Series, including 3 top-10s in 3 starts in 2004 while driving for Keith Murt. In 2004, Cobb made her NASCAR debut in the Busch Series at Homestead-Miami Speedway. She drove the No. 50 Vassarette Chevrolet for Keith Coleman Racing and finished 43rd due to a crash on lap 2. In 2006, Cobb created a line of clothing for female race fans called Driver Boutique. Proceeds from the sales of this line go towards her racing efforts, and she has attempted to qualify for various Busch and ARCA races in 2007 with the Driver Boutique sponsorship. On July 19, 2008, she competed in the Camping World Truck Series event at the Built Ford Tough 225. She started in 35th and finished 26 driving the No. 74 Dodge for The Annexus Group completing 144 laps. On April 27, 2009 she competed at the O'Reilly Auto Parts 250 driving the No. 73 Dodge for Derrike Cope Inc. She started 34th and completed 72 laps before experiencing engine trouble, finishing 26th out of 35 drivers winning a purse of $10,680. In 2010, Cobb announced that she would run full-time in the truck series, after purchasing the assets of the No. 10 truck team from Rick Crawford, whose Circle Bar Racing downsized from a two-truck operation to one — Crawford's own No. No. 14. In 2010, Cobb became the highest female points finisher in history in any of the three major NASCAR Series to that time, achieving 17th place. For 2011, Cobb continued racing her own No. 10 truck full-time in the Camping World Truck Series, and also drove the first 5 races in the Nationwide Series in the No. 79 for 2nd Chance Motorsports. Cobb later announced that she would run the full season with 2nd Chance Motorsports. the No. 79 and run for Rookie of the Year. Cobb became the highest finishing female in Truck Series history by finishing 6th at the 2011 NextEra Energy Resources 250. She later gave her truck's owners points to Chase Mattioli and his team while she also started her own driver development program with Cody Cambensy planning to drive in the Truck Series in 2011. She later left 2nd Chance Motorsports after a dispute with owner Rick Russell over whether to start and park after losing their second car at Las Vegas, where she confirmed she is not a start and park driver. Rick Ware Racing later gave her a ride in the No. 41. In early 2011, Cobb for her own team called Jennifer Jo Cobb Racing and partnered with U.S. Army Family and MWR Command to launch Driven 2 Honor, a promotion honoring women in the U.S. Military. Jennifer hosted 2 female service members and their guests at the first 5 Nationwide races of the 2011 NASCAR season. In 2012 Cobb ran the entire Camping World Truck Series schedule in the No. 10, along with selected Nationwide Series races in the No. 13. She returned to the Camping World Truck Series for 2013. For the 2014 season Cobb again ran in the Truck Series in her own No. 10 Chevrolet Silverado. The team began the season with a 21st-place finish in the NextEra Energy Resources 250. At the SFP 250 Cobb raced to 13th place which earned her highest finish of the season, she then had another strong run at the North Carolina Education Lottery 200 (Charlotte) finishing 16th. However, since that 16th-place finish, the team has seen a decline in performance as they have only managed to eclipse a best of 20th on three different occasions (Dover, Kentucky, and Michigan). Cobb also ran one race in the No. 87 car for Rick Ware Racing at the Kansas Lottery 300 finishing 24th, which was her first Nationwide Series start of 2014. On May 29, 2015, Cobb angrily approached the race car driven by Tyler Reddick on foot after apparently by being spun out by Reddick's truck at the Lucas Oil 200. It was expected that Cobb would be the first driver penalized under the new NASCAR rule instituted after Kevin Ward Jr. died in a similar incident. She wound up receiving a $5,000 fine from the officials. During practice for the 2015 Chevrolet Silverado 250 at Canadian Tire Motorsport Park, Cobb crashed and was subsequently caught on camera removing a cell phone from her truck. Cobb was given a P3 penalty by NASCAR for having a non-engine electronic component in her truck. As a result, Cobb was fined $5,000, plus an additional $2,500 for an infraction occurring while still on probation for the incident with Tyler Reddick where she left her truck following a crash. Cobb was the first driver penalized by NASCAR under the no cell phone rule since it was implemented following the 2012 Daytona 500. In 2018, Cobb joined Racing Total for her NASCAR Whelen Euro Series debut at Circuit Ricardo Tormo in Valencia. In 2018 her mother, Connie Cobb passed away. On May 15, 2013, Mike Harmon was arrested and charged with stealing a hauler and racing equipment belonging to Cobb, in association with his sister and Cobb's former partner Dave Novak; Harmon stated that he was innocent. On May 28, officials from the Rowan County Sheriff's Office seized five Camping World Truck Series trucks and two Nationwide Series cars, which were stated as belonging to Cobb, from Harmon's garage. ^ "Cobb to run full Truck Series season in 2012". NASCAR.com. Turner Sports. February 21, 2012. Retrieved 2012-02-22. ^ "NASCAR driver 'completely forgot' new rule, wanders onto hot track after vehicle crashes". May 30, 2015. ^ Turner, Jared. "Jennifer Jo Cobb fined, team penalized for cell phone in race truck". Fox Sports. Retrieved 2015-09-01. ^ Southers, Tim (April 6, 2018). "Jennifer Jo Cobb to make NASCAR Euro Series debut". Motorsport.com. Retrieved April 6, 2018. ^ Bromberg, Nick (May 15, 2013). "Mike Harmon out on bond after arrest for theft of Jennifer Jo Cobb's hauler". Yahoo! Sports. Retrieved 2013-06-01. ^ Pockrass, Bob (May 29, 2013). "Authorities seize racecars, trucks from Mike Harmon as Jennifer Jo Cobb dispute continues". Sporting News. Retrieved 2013-06-01. ^ "Jennifer Jo Cobb – 2004 NASCAR Busch Series Results". Racing-Reference. Retrieved August 29, 2015. ^ "Jennifer Jo Cobb – 2005 NASCAR Busch Series Results". Racing-Reference. Retrieved August 29, 2015. ^ "Jennifer Jo Cobb – 2006 NASCAR Busch Series Results". Racing-Reference. Retrieved August 29, 2015. ^ "Jennifer Jo Cobb – 2007 NASCAR Busch Series Results". Racing-Reference. Retrieved August 29, 2015. ^ "Jennifer Jo Cobb – 2008 NASCAR Nationwide Series Results". Racing-Reference. Retrieved August 29, 2015. ^ "Jennifer Jo Cobb – 2009 NASCAR Nationwide Series Results". Racing-Reference. Retrieved August 29, 2015. ^ "Jennifer Jo Cobb – 2010 NASCAR Nationwide Series Results". Racing-Reference. Retrieved August 29, 2015. ^ "Jennifer Jo Cobb – 2011 NASCAR Nationwide Series Results". Racing-Reference. Retrieved August 29, 2015. ^ "Jennifer Jo Cobb – 2012 NASCAR Nationwide Series Results". Racing-Reference. Retrieved August 29, 2015. ^ "Jennifer Jo Cobb – 2013 NASCAR Nationwide Series Results". Racing-Reference. Retrieved August 29, 2015. ^ "Jennifer Jo Cobb – 2014 NASCAR Nationwide Series Results". Racing-Reference. Retrieved August 29, 2015. ^ "Jennifer Jo Cobb – 2015 NASCAR Xfinity Series Results". Racing-Reference. Retrieved November 16, 2018. ^ "Jennifer Jo Cobb – 2016 NASCAR Xfinity Series Results". Racing-Reference. Retrieved November 16, 2018. ^ "Jennifer Jo Cobb – 2017 NASCAR Xfinity Series Results". Racing-Reference. Retrieved November 16, 2018. ^ "Jennifer Jo Cobb – 2018 NASCAR Xfinity Series Results". Racing-Reference. Retrieved November 16, 2018. ^ "Jennifer Jo Cobb – 2008 NASCAR Craftsman Truck Series Results". Racing-Reference. Retrieved August 29, 2015. ^ "Jennifer Jo Cobb – 2009 NASCAR Camping World Truck Series Results". Racing-Reference. Retrieved August 29, 2015. ^ "Jennifer Jo Cobb – 2010 NASCAR Camping World Truck Series Results". Racing-Reference. Retrieved August 29, 2015. ^ "Jennifer Jo Cobb – 2011 NASCAR Camping World Truck Series Results". Racing-Reference. Retrieved August 29, 2015. ^ "Jennifer Jo Cobb – 2012 NASCAR Camping World Truck Series Results". Racing-Reference. Retrieved August 29, 2015. ^ "Jennifer Jo Cobb – 2013 NASCAR Camping World Truck Series Results". Racing-Reference. Retrieved August 29, 2015. ^ "Jennifer Jo Cobb – 2014 NASCAR Camping World Truck Series Results". Racing-Reference. Retrieved August 29, 2015. ^ "Jennifer Jo Cobb – 2015 NASCAR Camping World Truck Series Results". Racing-Reference. Retrieved August 29, 2015. ^ "Jennifer Jo Cobb – 2016 NASCAR Camping World Truck Series Results". Racing-Reference. Retrieved November 16, 2018. ^ "Jennifer Jo Cobb – 2017 NASCAR Camping World Truck Series Results". Racing-Reference. Retrieved November 16, 2018. ^ "Jennifer Jo Cobb – 2018 NASCAR Camping World Truck Series Results". Racing-Reference. Retrieved November 16, 2018. ^ "Jennifer Jo Cobb – 2019 NASCAR Gander Outdoors Truck Series Results". Racing-Reference. Retrieved February 15, 2019. ^ "Jennifer Jo Cobb – 2002 ARCA Re/Max Series Results". Racing-Reference. Retrieved August 29, 2015. ^ "Jennifer Jo Cobb – 2003 ARCA Re/Max Series Results". Racing-Reference. Retrieved August 29, 2015. ^ "Jennifer Jo Cobb – 2004 ARCA Re/Max Series Results". Racing-Reference. Retrieved August 29, 2015. ^ "Jennifer Jo Cobb – 2007 ARCA Re/Max Series Results". Racing-Reference. Retrieved August 29, 2015. ^ "Jennifer Jo Cobb – 2008 ARCA Re/Max Series Results". Racing-Reference. Retrieved August 29, 2015. ^ "Jennifer Jo Cobb – 2009 ARCA Re/Max Series Results". Racing-Reference. Retrieved August 29, 2015. ^ "Jennifer Jo Cobb – 2010 ARCA Racing Series Results". Racing-Reference. Retrieved August 29, 2015. Wikimedia Commons has media related to Jennifer Jo Cobb.